Taking a cue from Julie D Ramsay's latest blog post for National Poetry Month and wanting to try out how Linky works, I am using this post to host a Linky/Pinterest Party! I know how much we love learning something new that we can use in our own classrooms to support our students' learning. The most powerful way that we can learn is from one another. A Link Party is a great way we can share what we love with others in our PLN. 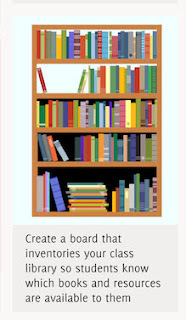 Please share links to your school library Pinterest Board so that other school librarians can benefit and share with their teachers and students.